Icinga Exchange – Plugin & Addon Repository! 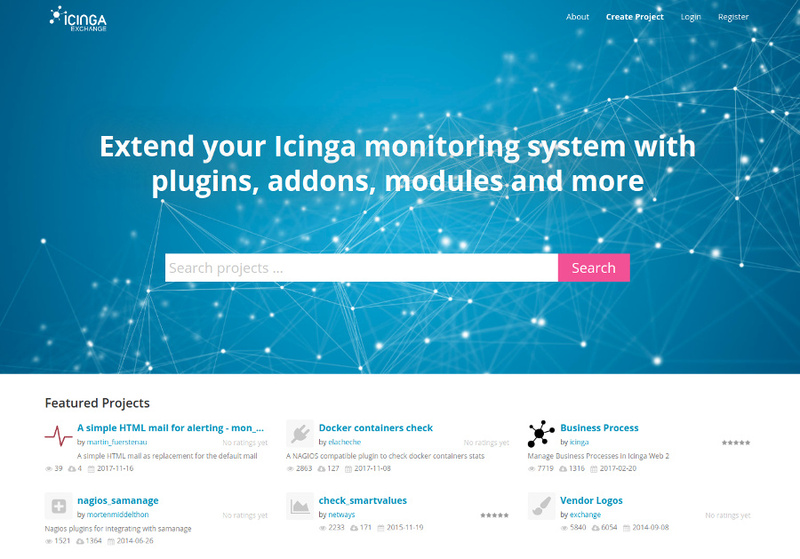 Finally a home for all the vagabond Icinga compatible plugins and addons out there – we are proud to team up with Monitoring Exchange to bring you Icinga Exchange. You can already find 500+ plugins, addons and other Icinga related projects on our new repository. These are super-fast to find thanks to a Solr based search engine combined with navigation tags for project type, vendor and monitoring target. The Solr search logic searches any term within a project and displays results as you type. Posting projects is also quick and easy, especially if you are already on GitHub. Either upload your project directly or take advantage of our GitHub Sync feature. To do so, simply add our project-sync feature to your GitHub tree and tell us your GitHub repo URL. When you update your GitHub project, your project will be automatically updated on Icinga Exchange. We’ve tried to make maintaining projects just as convenient; as such Icinga Exchange supports multiple releases and Markdown documentation. With Icinga Exchange we hope to give Icinga compatible plugins and addons a home. And there are no prejudices here – Icinga compatible often means Nagios, Shinken, Naemon, Centreon, Zabbix, OpenNMS compatible too and these are all welcome at Icinga Exchange. So, hop on over to exchange.Icinga.org and browse through our new repo – feel free to add or update your project and get some more airtime for your hard work. The Icinga community is all about sharing that monitoring love around.